Keep your screen crisp and clear by preventing screen burn on the Samsung HP-R5052. 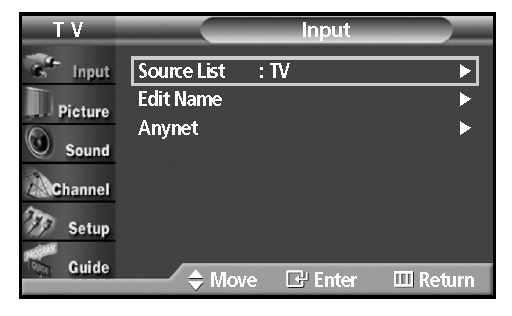 Your Samsung HP-R5052 TV has a simple, easy-to-use menu system that makes it convenient and fast to use. There are some important features you need to set up to ensure your Samsung HP-R5052 keeps it crisp screen and clear images. With the power on, press the MENU button on the remote control. The main menu appears on the screen. 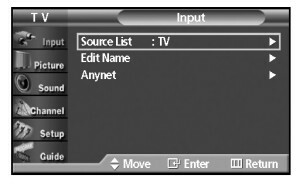 Select the INPUT menu choices. 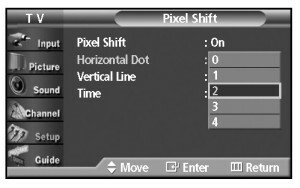 Press the left / right / ENTER buttons to display, change, or use selected items. NOTE: The on screen menu will disappear from the screen after two minutes. Press MENU to open up the menu again or EXIT to leave the menu area. 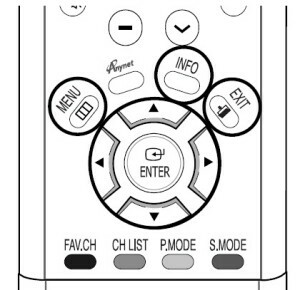 To get info on your settings: Press the INFO button on the remote control. 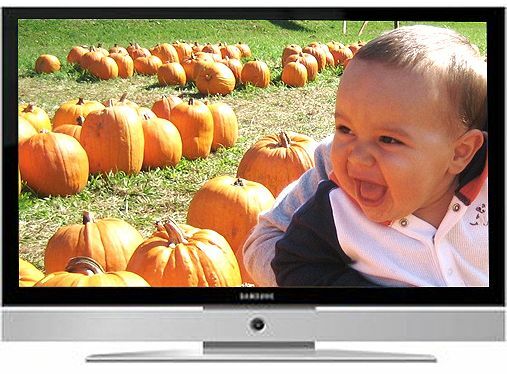 The wide screen format on your Samsung HP-R5052 TV is designed for a 16:9 aspect ratio. Watching films from DVDs or video games can result in dark side-bars on the screen. 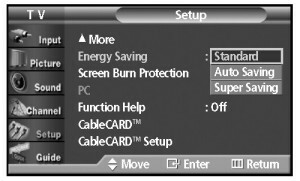 Side bars as well as stationary images on the screen such as computer graphics and logos or patterns and can create an uneven aging of the PDP display. 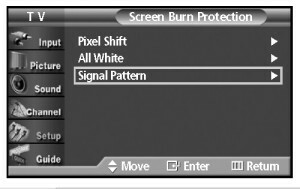 The result is image retention, images burnt into the screen creating ghost images on the screen. To reduce image retention, the Samsung HP-R5052 TV is equipped with screen burn prevention that allows you to move the picture around the screen. Press the up or down button to select SETUP. 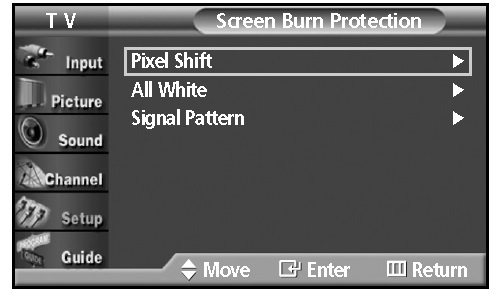 Press the up or down button to select SCREEN BURN PROTECTION. 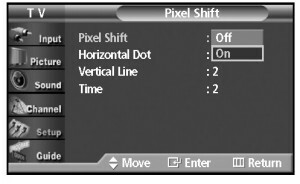 Scroll down to PIXEL SHIFT. 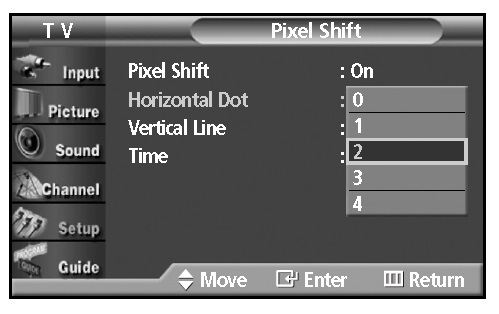 NOTE: Pressing the up or down button alternates between ON or OFF for this option. 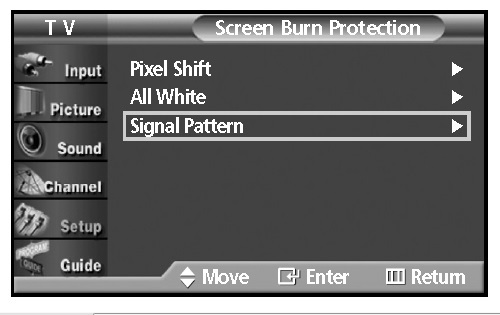 If screen burn has occurred, you can select a white screen or signal pattern (rolling screen) to help remove screen burn artifacts. ALL WHITE: Removes after-images on the screen by changing coloured pixels to white. 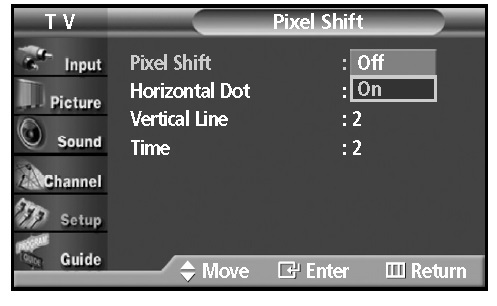 SIGNAL PATTERN: Removes after-images on the screen by moving all the pixels on the PDP according to a pattern. NOTE: Signal Pattern is the more effective of the two. NOTE: This after-image removal function has to be executed for a long time (approximately 1 hour) to effectively remove after-images on the screen. Repeat if after-image is not removed. This feature adjusts the screen brightness automatically depending on the surrounding lighting conditions. Press the up or down button to select ENERGY SAVING. 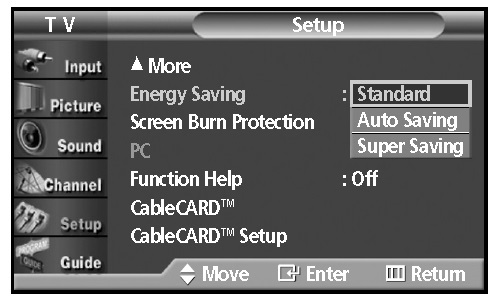 Auto Saving : Automatically adjusts to the surrounding lighting. Super Saving : Enters maximum power saving mode regardless of the surrounding lighting.